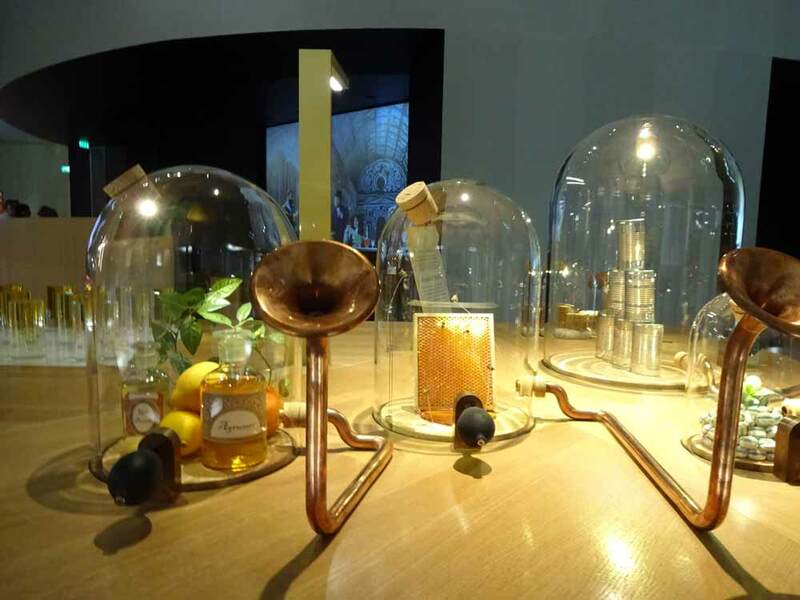 A visit to La Cité du Vin is a highlight of any wine and gourmet trip to Bordeaux. Here is how to make the most of your visit. As local, we love Bordeaux’s La Cité du Vin. It really is unlike any museum you’ll have seen before, and a real highlight of Bordeaux holidays. In fact, it’s misleading to even call La Cité du Vin a ‘museum’. It’s much more than that. La Cité du Vin is a modern theme park. It’s a wine bar, a library, a wondrous, cavernous creation that lives and breathes wine heritage. La Cité du Vin opened in 2016 and now attracts 400,000 visitors a year, including many who visit us for Bordeaux holidays. It really does bring Bordeaux wine holidays right to into the city centre. We think La Cité du Vin is a stroke of architectural genius. On the outside, its magnificent curved exterior is designed to reflect wine swirling in a glass. On the inside, it’s as full-bodied as any smooth Bordeaux red. It has now become a landmark in the city. 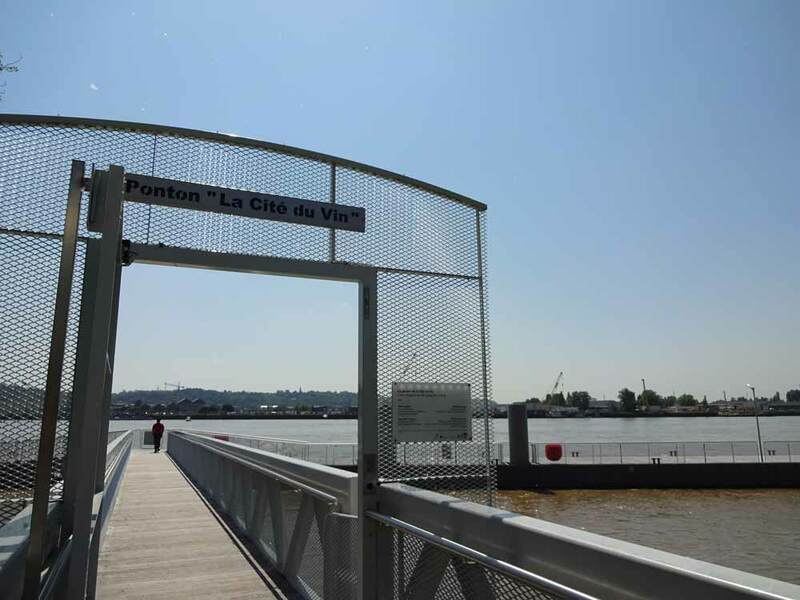 We’ve visited La Cité many times but every time we feel we enter a magical world ! You are taken on an adventure through the history of wine. It’s a journey not just to Bordeaux, but around the world. From the Romans to the Rhine Valley, from the vines of Margaux to Margaret River. There is so much to see ! The main points of interest are concentrated over a number of floors, each accessible by elevator. On arrival you pick up a smartphone and headset, pick the langage of your choice, and this becomes your travel companion. There are also guided tours available, which we can reserve for you. See our interview with Pierre Tesson from La Cité du Vin June 2018 here. 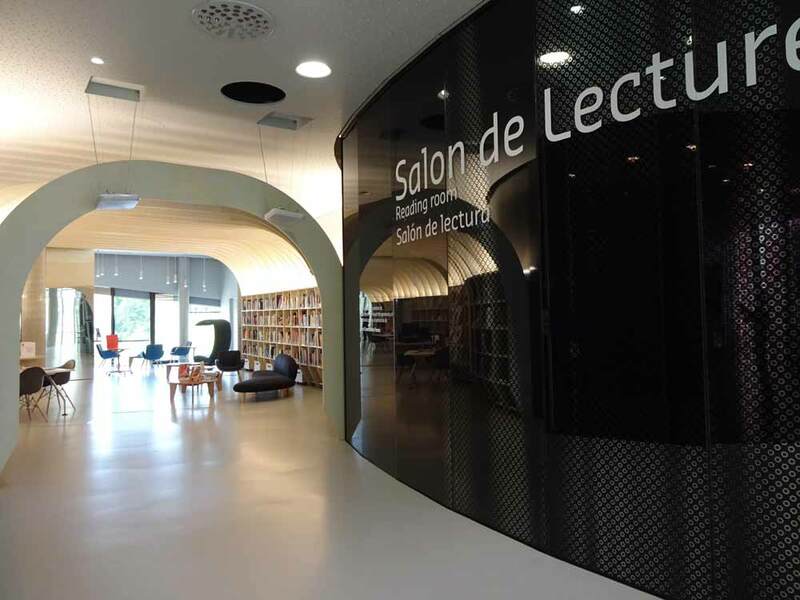 The reading room at La Cité du Vin, Bordeaux is a great place to read about wine, civilisation, etc. The first floor houses temporary exhibitions – these change often and always give us new excuses to visit. There are also reading rooms, education rooms and a connoisseur’s lounge. This is where various workshops are run throughout the year. We attend these regularly, as the program is always varied and interesting. Many workshops are also conducted in English during the high season. Our clients appreciate taking part in one of these workshops in particular the dicovery one on Bordeaux or the multi-sensory workshop, which is our favourite. 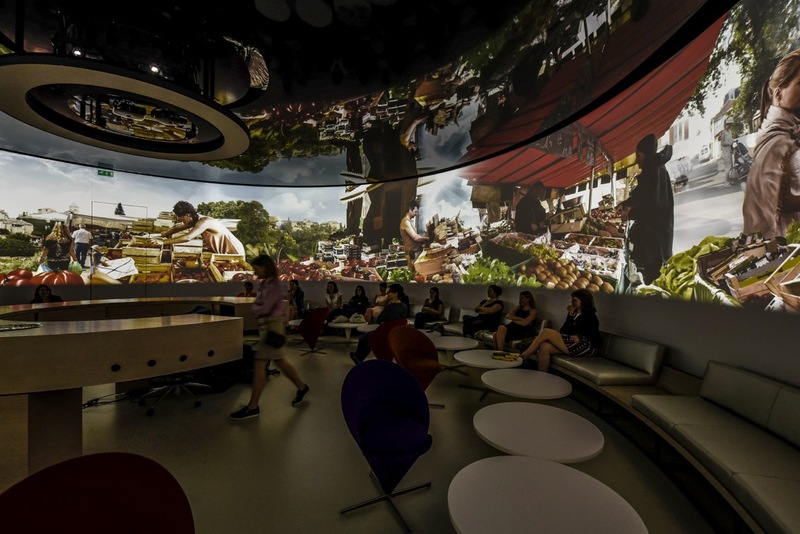 Seated comfortably in an immersive space , you enjoy 360° images of different markets around the world, with lights, sounds and smells effect. A virtual pairing is experienced in each market with a glass of wine. We also love the permanent exhibit on the second floor. This space is made up of treats for all your senses. There are films, animations and audio displays. 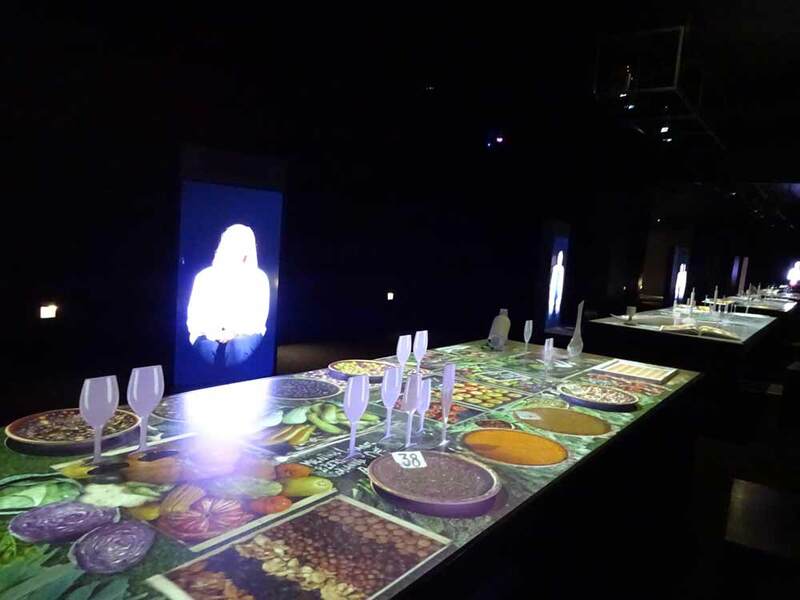 There are also fabulous sensory areas where you can develop an understanding of the relationship between wine and smell. In this way, La Cité du Vin has really introduced us to new ideas about wine and it is interesting wether you are a fine connoisseur or a novice. Test your nose against the scents of the vines. What’s great about this place it’s all about using innovative ways to present, make you participate and interact with the different screens, objects and surroundings. Obviously as locals we recommend you spend more time in the section on Bordeaux where many famous Grand Cru chateaux are reconstructed in wooden miniatures. This ‘city of wine’ expands well beyond the banks of the Garonne, though. Having travelled all over the world, this is an aspect we especially appreciate. Find out about the links between Greek gods and wine, or journey through Roman wine-making traditions or Pacific Island ideas. It’s not so much a ‘city of wine’ but a ‘world of wine’. Share the secrets of wine and food during a conversation with digitalised sommeliers and chefs. The eighth floor is home to Le Belvedere, a spectacular bar where you can enjoy a free wine tasting that’s included in the ticket price. Look up and you’ll see a ceiling covered in glasses, a masterpiece of art that’s both visually stunning and functional. Look out and you’ll see fantastic views of the river and our beautiful Bordeaux city centre beyond the glasses. Le Belvedere bar at La Cité du Vin, Bordeaux. You really could spend hours exploring La Cité du Vin. It’s therefore a good thing that there’s a number of eating options here as well. Firstly, there’s the seventh floor panoramic Restaurant Le 7 for a truly special dining experience. This is one of our favourite restaurants in Bordeaux. We can make reservations for you to ensure you don’t miss out! There’s Latitude 20, which is not only a snack bar and wine bar but an amazing wine cellar where you can buy bottles from around the world. If you’re after a red from Ethiopia, a white from Syria or something special from Bali, then this is the place to go. 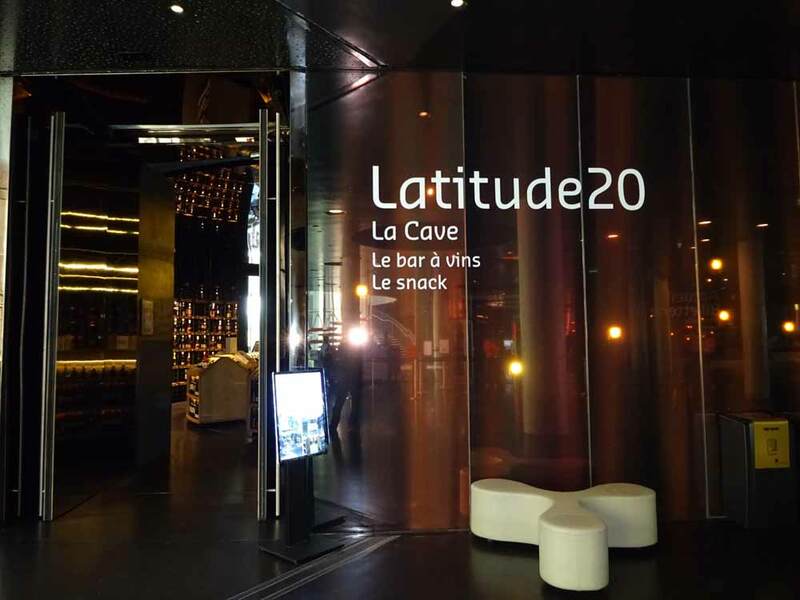 The Latitude 20 bar and cave at La Cité du Vin, Bordeaux. For simple snacks and well-priced bites, there’s also an outdoor terrace serving takeaway quiches, sandwiches and coffee. This is a great option for families. 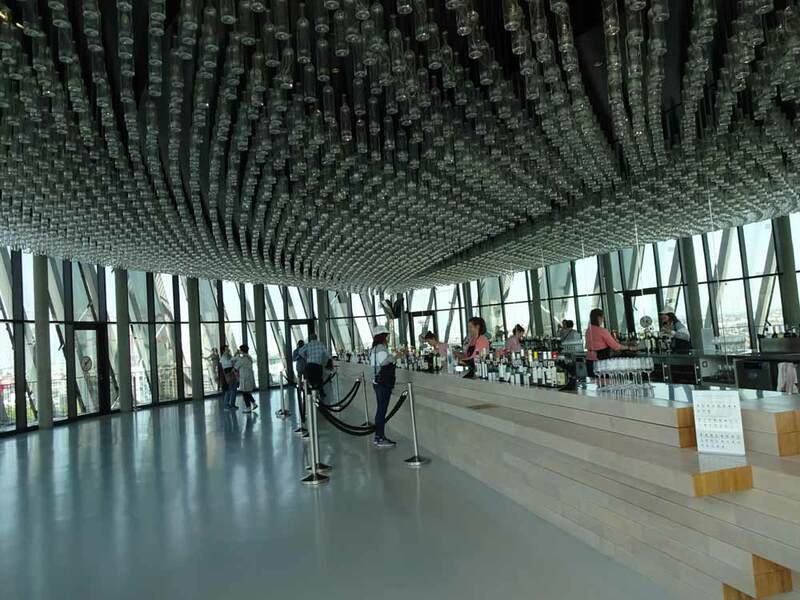 La Cité du Vin is a wondrous, fascinating experience that will captivate food and wine-lovers, and impress anyone with an eye for architecture. Tickets: At Greens & Grapes we can include a visit to La Cité du Vin on your Bordeaux wine and golf itinerary. We can also advise you on the workshop you could include as part of your visit. La Cité du Vin is at 134 Quai de Bacalan, 33300 Bordeaux. We can arrange your transport as part of your itinerary. If you’re visiting on your own, you have several options. There’s a dedicated car park if you’re driving. However, we recommend public transport as this area of Bordeaux can be busy. Tram: Line B for the ‘La Cité du Vin’ stop. La Cité du Vin’s own river boat dock in Bordeaux. River boat: This is a delightful way to arrive. There is a dedicated stop and boats run approximately every 45 minutes. Bike: There is a parking station for the city’s public bike scheme out the front. 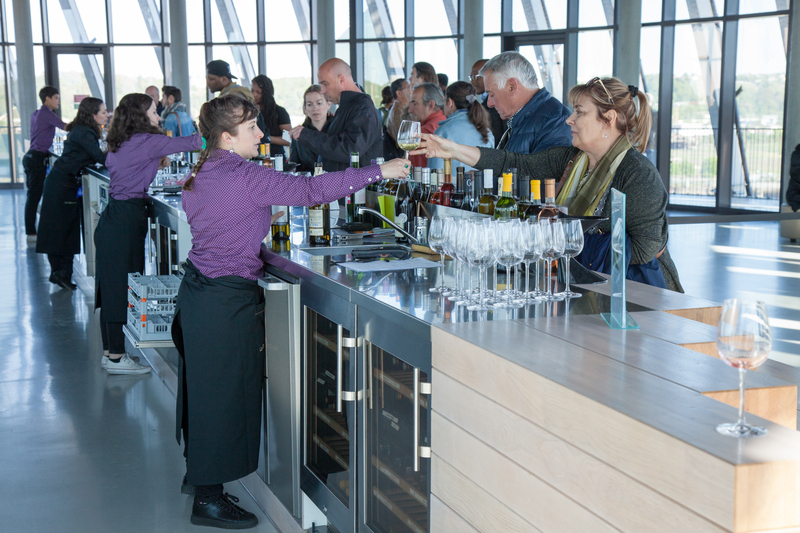 Ask us to tailor a golf and wine package for you that includes the fabulous La Cité du Vin.